The Royal Ballet: "The Dream" and "Song of the Earth"
After an eleven-year absence, this world class troupe returns for a woefully short season. The Joyce Theater Foundation is presenting a short season of the Royal Ballet at the David H. Koch Theater in Lincoln Center, the Royal’s first visit to New York in 11 years. After a gala opening night, the Royal showed its regal stuff in a program consisting of Frederick Ashton’s The Dream and Kenneth MacMillan’s Song of the Earth, two works which couldn’t be less alike. In fact, the only thing they had in common was excellent, stylish dancing. The first ballet is a warm, witty and sensuously colorful take on its Shakespearean source while the latter is colorless in every sense of that word, so concerned with formality and form that it is devoid of color and, for the most part, emotion. Both works were performed to live music with the orchestra, chorus and soloists conducted by ballet veteran Barry Wordsworth. 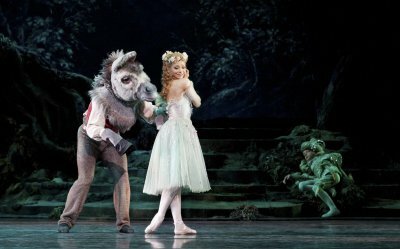 The Dream, to the famous Mendelssohn score as arranged by John Lanchbery, tells the tale of lovers lost in the a magical forest ruled by Titania (Sarah Lamb) and Oberon (Steven McRae) who are first seen arguing over possession of a Changeling Indian Boy (Charles Goehring, young, but quite self-possessed). The lush single forest set by David Walker is dominated by a large tree into which Titania retires, first alone and then with Bottom and finally, at fade out, with Oberon. Walker’s delightfully shimmering tutus for all the fairies (all wearing flowing wigs), the exotically glittering costumes for Oberon and his minion, Puck, and the cartoonish, early Victorian outfits for the four lovers and the Rustics were a show in themselves. Ashton tells the plot economically, yet with rich detail in mime, telling steps and great timing. Titania’s Fairies, led by the quartet of Peaseblossom, Cobweb, Moth and Mustardseed (Akane Takada, Emma Maguire, Meaghan Grace Hinkis and Romany Pajdak, all enchantingly light and airy) performed Ashton’s complex and demanding point work with finesse, achieving the quick-silver direction changes, the light hops on toe and intricate corps de ballet formations. Puck (the sly, buoyant James Hay) was constantly flinging himself into difficult jumps and turns, including his signature step, a bent-legged leap. The confusion that ensues after Puck douses the wrong people with the famous love potion was amusingly portrayed by Itziar Mendizabal (a robust, passionate Helena), Johannes Stepanek (the nasty, then loving Demetrius), Christina Arestis (the piquant, but restrained Hermia) and Valeri Hristov (the passionate Lysander whose love object changes from Hermia to Helena and back to Hermia). As Bottom, the extraordinary Bennet Gartside managed to exude comedy and pathos as Titania’s inadvertent one-night stand. It was Ashton’s genius to put Bottom on point to simulate hooves, a feat which Mr. Gartside pulled off effortlessly. The high point of The Dream is the long, final duet between Titania and Oberon, danced with grace and passion by Ms. Lamb and Mr. McRae who caught every nuance of position, glance and music as they kept melting into each others’ arms. The vision of Ms. Lamb’s long balance on point mid-Pas de Deux will remain with me for a long time. Kenneth MacMillan’s Song of the Earth took Mahler’s shimmering, colorfully orchestrated score and produced a tedious, over-long, ballet grasping at deep meaning. Mahler, in a spiritual slump, was inspired by the lovely, exotic The Chinese Flute, a suite of Chinese poems translated into German by Hans Bethge. Mahler played around with the pentatonic scale and used exotic instruments like gongs to imbue the music with an Asian tang which inspired MacMillan, generally known as the story-teller of the ballet world of his day, to phony Oriental stylizing. There is an overall feeling of stiffness and formality, including a much-repeated pose in which the dancers shuffled knees together in plié, bent over at the waist, arms held in a large circular position—straight out of a touring company of The Mikado. For some reason, none of the six songs, which deal with the beauty of youth, loneliness, drunken abandon and the general misery of life, itself, are named and no translations are given. The lead dancer is called the Messenger of Death. Carlos Acosta who danced that part couldn’t seem to decide whether he was supposed to be foreboding, godlike or loving. He was often paired with the second male lead, Nehemiah Kish, a smoothly classical dancer, who led the corps de ballet, taking on the role of lover, chum to a bunch of cavorting men, and helpmeet to Mr. Death. The bland rehearsal wear costumes in black (Mr. Acosta), white (Mr. Kish) and shades of grey (the rest of the cast) by Nicholas Georgiadis were at odds with the score as was Mr. MacMillan’s coolly repetitious choreography. Some color might have helped turn the recurring unison patterns of the choreography into something more interesting to look at. The backdrop of shifting grey lines was similarly unilluminating. The dancers’ commitment and intensity gave Song of the Earth what interest it had. The attention to every detail and the liquid use of the upper body and arms were beautiful. A duet danced by Mr. Kish and Marianela Nuñez had a hint of passion which dissipated when they were joined by the rest of the cast in the final song. Katherine Goeldner and Thomas Randle were the fine singers who overcame the notoriously dead acoustics of the Koch Theater with power and finesse. A lushly produced, beautifully danced program of dizzyingly busy choreography. A wonderful evening: two major masterpieces performed with elegance, energy and creative warmth. A rare historical theatrical spectacle that told its tale with a balance of emotion and stagecraft, performed by a large company. A riveting piece of theater on every level, even as it replicates, for us, a hidden and complex chapter in near-recent history.